Before you depart for the evening to watch poll coverage, please chime in if you have any info on these two fine questions from readers just like you. Please emai lus or leave a comment, and feel free to email us a new question or an old one that we never resolved. 1) Montrose: A reader needs help getting into the Rock Haven Sanitarium. Calling out all personal connections. "I noticed the other day that the Rock Haven Sanitarium in Montrose (the old "Screen Actor's Sanitarium") was up for sale and might possibly be turned into condos. Would you know if it is possible to walk through the grounds before the property is sold? I am not a potential buyer, but I spent five days there in 1947 as a twelve-year-old child (for reasons I am still not sure of) and I would love to see if my memories of the place are accurate. It might close a chapter in my life that has always haunted me. If you cannot help me, perhaps you could put me in touch with someone who could." 2) Hollywood: Compared to the Sunset-Vine tower, we're not so sure the phrase "taking forever" is appropriate. 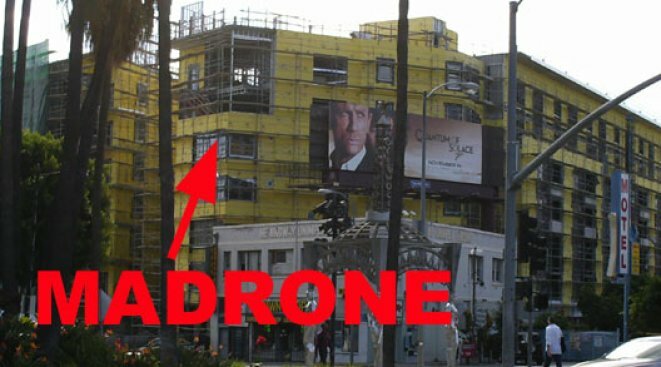 "So, why is the Madrone project at La Brea and Hollywood Blvd. taking forever? That yellow construction siding has been on since the dawn of time... it's only about seven stories, what's the drama?"